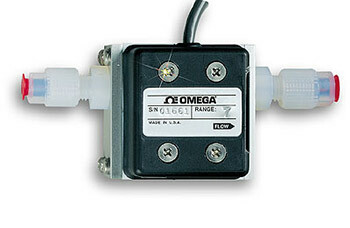 FPR1501 Series flow sensors can measure extremely low flow rates from 15 mL/min. They are suitable for a wide variety of industrial, commercial, and laboratory flow applications. Because the FPR1501 flow sensors have only PTFE and sapphire wetted surfaces, it is anticipated that they will replace conventional glass tube and ball flowmeters in many applications in which an electrical signal proportional to flow rate is desirable, even in very corrosive applications in which the liquid is low in viscosity (i.e., less than 10 centistokes). Models use a Pelton-type turbine wheel to determine the flow rate of the liquid. The rotation rate of the turbine wheel is linear over a large dynamic range. The electro-optical system consists of a diode emitting energy in the infrared spectrum. Light energy is interrupted and passed from 8 small holes in the small turbine wheel. This reflected light energy is detected by a photodiode. Thus, as the turbine wheel rotates in response to the liquid flow rate, electrical pulses are generated. Processing circuitry provides a DC voltage output and buffered square-wave output pulses that are proportional to the flow rate. 3/8" tube fitting for flow rates greater than 2 liters/min. 참고: Comes complete with 0.9 m (3') long cable with pigtails and operator's manual. Note: Maximum differential pressure (delta P) across flow sensor occurs at maximum rated flow using water at 23°C (73°F). At 50% of rated flow,delta P is 0.25 of value at max. rated flow, and, at 20% of rated flow, delta P is 0.04 of value at max. rated flow.